Jesse is the fastest runner in his school, but is bullied by other boys and girls. Leslie, a newcomer beats all the boys in all-boys race leaving them all panting. In this race, Jesse comes second. That is how Jesse and Leslie meet. At first, he is not very friendly with her. But she finally becomes Jesse’s best friend as she converses with him frequently being a neighbour. They travel to school by bus along with Jesse’s younger sister May Belle. Jesse and Leslie explore the forests to find a place “just for themselves”, away from school and bullies. They find an abandoned treehouse and reset the place. They transform it into a fantasy land- the Kingdom Of Terabithia with warriors, giants and prisoners of The Dark Master by just “keeping their minds open”! They declare themselves to be the King and Queen. They also vow to release all the prisoners of The Dark Master. Their game continues, and in school they overcome all the bullies. One day, Ms. Edmunds, Jesse’s teacher, calls Jesse to accompany her to the museum. Jesse firsts thinks about calling Leslie too, but hesitates and leaves off without inviting her. He enjoys his first ever trip to a museum, thoroughly. But when he comes back, he meets his family to find the shocking news of Leslie’s death. The rope that helped Jesse and Leslie to go to Terabithia had cut off, and her head had hit a rock causing her death. He gets mad and runs to the forest calling out Leslie’s name. A voice replies calling out his name, and for a moment he is overjoyed assuming that it is Leslie. But to his dismay, he finds the voice to belong to his younger sister May Belle who had followed him silently. He pushes her down rudely and asks her to go back since it was “their” place. From there he runs to find The Dark Master but he finds only his father running behind him, worried for his safety. He starts crying and his father comforts him. He blames himself for Leslie’s death as he hadn’t invited her to the museum. Finally he decides to remember Leslie and chooses his young sister as the princess of Terabithia. 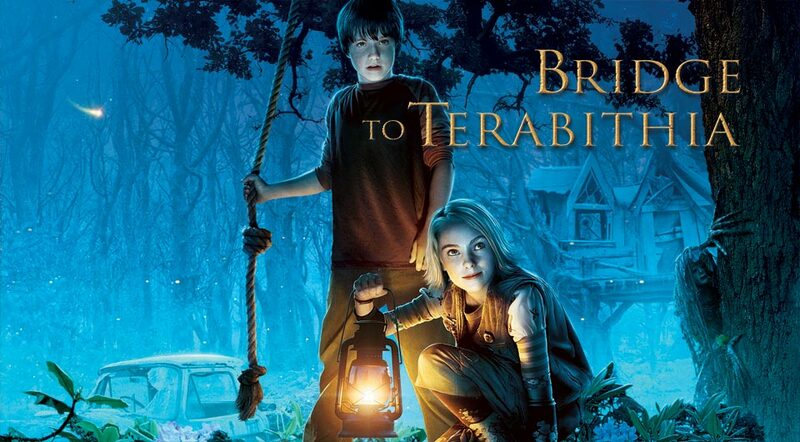 Instead of the rope, he makes a bridge to Terabithia- a secret that he and May Belle shares forever! The movie was o-k-a-y. It wasn’t great or amazing.